Nor is it possible to ‘hide’ a Saturn V launch from Vandenberg. It would have been visible not only from Lompoc and other nearby cities, but throughout central and southern California. Dr. Michael E. Salla, “Did the USA/USSR fly a Secret Joint Mission to the Moon in 1976 to investigate a crashed extraterrestrial mothership?” http//www.exopolitics.org/ ExoComment-51.htm. 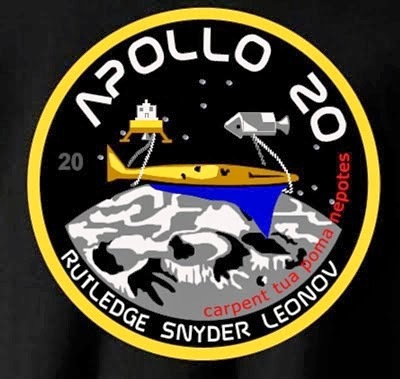 Snyder’s name was misspelled, and the ASTP mission involved three U.S. astronauts and two Soviet cosmonauts. The Apollo 17 mission was in December 1972, not during 1971. Scantamburio, “The Apollo 20 Case: Debunking Or A Trojan Horse For The Truth?” The wording is that used in the original posting. Charles D. Benson, William Barnaby Faherty, Moonport A History of Apollo Launch Facilities and Operations (Washington, D.C.: NASA SP-4204, 1978), and Kenneth Gatland, The Illustrated Encyclopedia of Space Technology Second Edition (London: Salamander Books, 1989), p. 305. In April of 1981, I was at the Kennedy Space Center for the STS-1 shuttle launch, and saw the VAB, Pad 39A, and the crawler-transporter. I was at Vandenberg AFB in June and December of 1996 and saw a number of abandoned launch sites. I also watched the launch of a NRO reconnaissance satellite from the press site on December 20, 1996. Apollo Spacecraft News Reference, North American Aviation ca. 1966 (Apogee Books reprint, 2006) p. 9, and ApolloHoax.net, http://apollohoax.proboards21.com/index.cgi?action=display&board=theories&3thread=1178402817&page=l The specific posting was: Reply #44 May 23, 2007; “Count Zero” . ApolloHoax.net, “Bob B.” Reply #45 May 23, 2007, Reply #47 May 25, 2007, and “Count Zero” Reply# 51 May 26, 2007. Ibid, and Bob B.” Reply #54 May 26, 2007; “nomad” Reply #65 June 7, 2007. Robert Godwin, Apollo Advanced Lunar Exploration Planning (Burlington, Ontario, Canada: Apogee Press, 2007) p.15.